Researchers conducted a study that examined the effects of the 5:2 on the body’s ability to metabolize fat compared to a daily calorie-restriction diet. But the study was small and further investigation is needed. 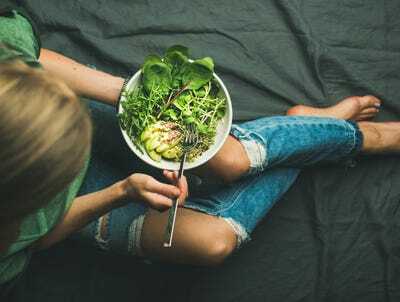 Intermittent fasting was one of the most talked-about diet trends in 2017, and now new research from the University of Surrey suggests that following such a diet could have real health benefits. In a study published in the British Journal of Nutrition, researchers assigned 27 overweight participants to either the 5:2 diet or a daily calorie-restriction diet, and told to them to lose 5% of their weight. The study aimed to look at the effects of the 5:2 on the body’s ability to metabolize fat and glucose following a meal and compared it to the effects of weight loss achieved by a daily calorie-restriction diet. Meanwhile those on the daily diet were required to eat 600 calories less each day than their estimated requirements for weight maintenance – women ate about 1,400 calories and men ate about 1,900 calories a day. However, of the participants who did complete the experiment, those on the 5:2 reached their goal of 5% weight loss in 59 days compared to those on the daily calorie-restriction diet who achieved it in 73 days. The researchers found that those on the 5:2 cleared the fat (triglyceride) from the blood after meals quicker than those on the daily calorie-restriction diets. “A reduction in systolic blood pressure reduces pressure on arteries, potentially lessening incidences of heart attacks and strokes,” the University said. Rona Antoni, a research fellow in nutritional metabolism at the University of Surrey, said: “As seen in this study, some of our participants struggled to tolerate the 5:2 diet, which suggests that this approach is not suited to everybody; ultimately the key to dieting success is finding an approach you can sustain long term.